Western blot analysis of Jurkat cell lysate (lane 1 & 2) probed with Rabbit anti SOCS-1 antibody (AHP2346). 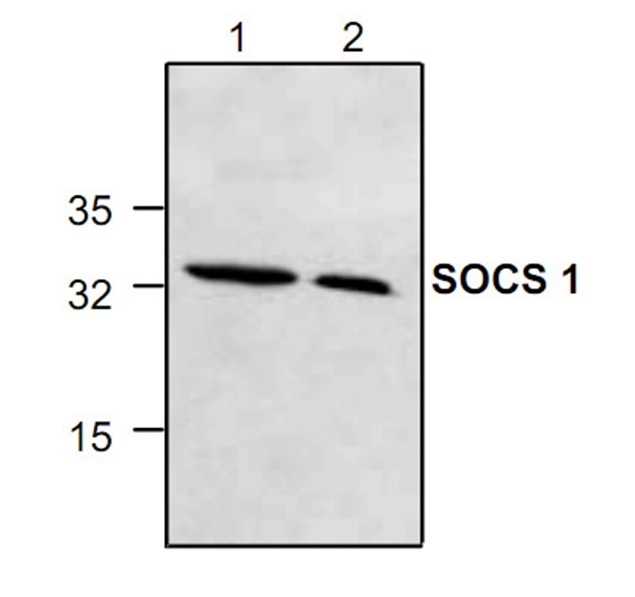 Rabbit anti SOCS-1 antibody recognizes a protein known as suppressor of cytokine signaling 1 (SOCS-1). SOCS-1 suppresses dendritic cell and T cell hyperactivation in response to cytokine signaling by inhibiting the JAK tyrosine kinase. This gene functions downstream of cytokine receptors, and takes part in a negative feedback loop to attenuate cytokine signaling.